Connect your headphones with ease to the Lightning to 3.5mm Headphone Jack adapter, and listen to all your favourite entertainment on devices like your iPad or iPhone 7. 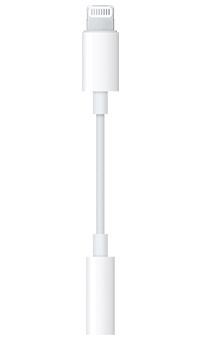 Plug Apple devices that have a Lightning connector (like your iPad, iPhone 7 or iPod Touch) into the adapter to connect with your 3.5mm-jack headphones. You'll get the very best performance levels when you buy the Lightning to 3.5mm Headphone Jack Adapter. That's because it supports Apple's latest operating platform (iOS 10 or later).